I spent a hellish week constantly playing different live game shows for real money apps. This is my story. For the past four months or so, the Live Game Show For Money genre has exploded into what feels like an all-consuming, intrusive toll on my cell phone. The fad started with an app called HQ, founded by the inventors of video streaming app Vine. They combined their live streaming platform with a simple, synced-up overlay and an impossible-to-follow chat room to create the phenomenon we’re following today. Every day, dozens of pop-ups have intruded my phone, alerting me to new live shows, chances to win dozens of pennies, and don’t forget to invite your friends for our $10,000 game later. It’s maddening. It’s like Hieronymus Bosch created a genre of apps. HQ frequently caters to millions of users every day, getting fifteen-minute intervals of viewers that GSN could only dream of. With their massive user base, app developers around the world have taken notice and are trying to out-HQ HQ with similar apps. I’ve tested a few of them, including HQ, and as a trivia fan and game show fan, these are my findings. I’ve spent the past week endlessly playing different live game show apps on my cell phone. From a technical perspective, I’m running all of the games on my personal iPhone X, running the latest version of iOS 11. Most of the time, I’m playing the game on my Verizon Wireless LTE connection, but if I’m at home, I’m hooked onto my home WiFi. I’ve ignored my family and friends, interrupted dinners and date nights, and bothered practically everyone I’ve ever met to play these games, all in the hopes of getting extra lives so I can play these games and win. To paraphrase Tyrone Biggums, y’all got any more of those Extra Lives? If you’ve never played any of these games (God bless your soul), here’s a basic outline of how each of them work. Each game is scheduled for a certain time of the day. HQ, for instance, has live shows at 3 PM and 9 PM EST. When the game starts, a question and 3 or 4 answers are presented to you, and you select one within the (usually short) time limit. If you get the answer right, you continue playing. If you get the answer wrong, you’re finished playing and cannot win anything. Winning conditions vary, but usually if you answer all the questions right, you win. Money is added to an in-app account, and can be cashed out to a PayPal account if you hit a minimum value. Usually, you have 90 days to meet that minimum and cash out or else you forfeit the money (read that fine print!). 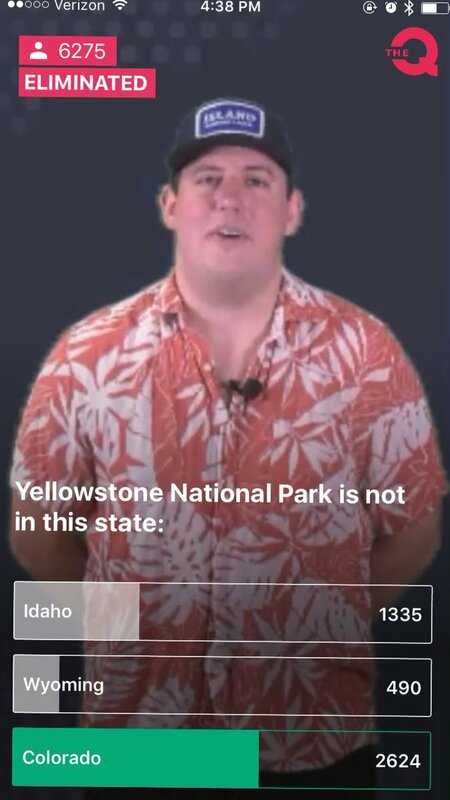 The Patient Zero of the live game show app epidemic is HQ. Of all the games I’ve tested, none have as polished a broadcast as HQ—when it works. Most of this week has been fine, but my final day of testing ran into a technical difficulties screen after Q1 and about 3 minutes of host Scott Rogowsky tap-dancing while techs struggled to fix the issue. Which of the following is not an acronym? After 9 seconds of panic, I used the remaining second to pick NORAD without any rhyme or reason. The host pointed out that acronyms are made up of the first letters of a phrase and are pronounced like a word, while initialisms are made up of first letters but each letter is individually pronounced when spoken, so the correct answer is A. I’m not the kind of petty person to look something like that up in a dictionary afterwards, but I did it anyway because actually I am that kind of petty person, and whaddaya know, the terms “acronym” and “initialism” are basically interchangable. This is one of the biggest issues with not only HQ and the other show apps that I’ve tested. When a question or answer on a real game show is presented in a questionable way, the ability to appeal is simple: you talk to the producer. You talk to Standards and Practices. If there is merit, then you get a second chance; you start over or they redress the balance in some way, shape or form. With games like HQ, all you can do is shout into the void of Twitter or Facebook, begging for retribution, which usually comes in the form of Extra Lives, a lifeline that saves a player from an incorrect answer once per show. I’ve only won once, while I was a party with some friends, and I was able to cash out my $14.08 to my PayPal account once HQ updated their app to remove their previously-held $20 minimum. HQ, when it works, is an impressive package. Playing with other people in the same room as you is a lot of fun, and the synchronicity between two phones is incredibly in-sync; an impressive technical feat. Big payouts still happen but are incredibly rare; winners often leave a game with $10 or less. 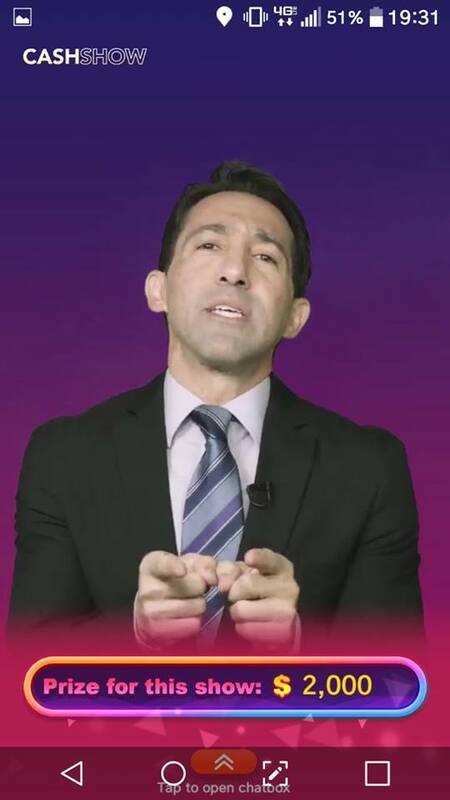 HQ’s most recognizable host, the aforementioned Rogowsky, does an excellent job of vamping through questions while the computers that run the game struggle to handle the million-plus people playing. Other hosts try to match his energy but lack the improvisational skill to fill dead air with anything entertaining. 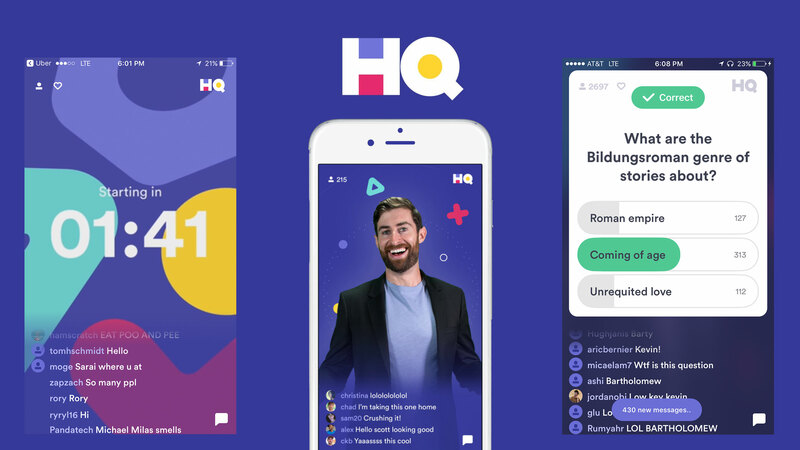 If HQ improves their trivia writer’s room—and it looks like they may soon do that—then HQ would still be my top recommendation for a fun 15 minute game show diversion on your mobile. If you wanted something less polished, and less good, well, there is an option—The Q. Created by one of the founders of the anonymous and hate-speech-filled app YikYak, The Q does everything that HQ does, but with a surprising lack of polish. The Q has a 12-question format, and winners get cash if they make it through all 12 questions perfectly. The questions range from insultingly simple (a recent question legitimately asked “What is 2 plus 2” with answers of 4, 5, and 6; surprisingly and sadly, more than 0 people got the question wrong) to practically impossible (one question situated at Question 8—meaning that there should be four questions harder than this one—asked for the US patent number of the first pop-up toaster, with the three choices being 1394450, 1394451 or 1394452. If that was a question was worth $50,000 on Millionaire, you’d throw a toaster at your TV). The hosts have the personality of a cardboard cut-out and often appear as if they lack confidence to be on-camera or read from a prompter. For an app that takes so much from HQ, it’s surprising what the app lacks. There is no mechanism for saving an incorrect answer: you can’t buy a lifeline, nor can you invite a friend for an Extra Life, like HQ. You can’t like, comment or subscribe. You just play and when you’re out, you’re out. The payouts are far less than the massively-funded HQ, but lousy questions have prevented me from winning more than $18 in the app, to which I can’t cash out until I hit $25. With a smaller audience, an app like The Q could do amazing things with the space—and sometimes tries to. Sunday night’s game was all Grammy themed, which was a refreshing change of pace, but hundreds of players complained when the first question, “The Grammy Awards celebrate what art form” didn’t register the correct answer, “music.” If The Q tried to be more unique compared to HQ—play more games daily, hire better writers, play with the format a bit more—along with some extra polish to their app and poorly green-screened host presentation, they’d be a worthy HQ opponent. It all seems like very wasted potential. What’s nice is that they play two hours before HQ, so you’re not interfering with The Big Show of HQ. Cash Show: Where’s My Money? Cash Show is probably the most clever rip-off of HQ, both in its production and its gameplay structure. Cash Show is run by ZenJoy, a Chinese app developer based in Shanghai. Unlike The Q or HQ, which has personalities and an active social media presence, Cash Show doesn’t have a live host—every game starts with a selection of pre-recorded spiels hosted by a slick-looking man who never identifies himself. The game streams pre-recorded voice clips through playing the game, and ends with the same pre-recorded spiel hosted by the same slick-looking man. The game starts at a scheduled time, and has a chat room and people playing, but the app isn’t a game show like HQ or The Q; it’s just a trivia app that you can only play at 3:30 and 9:30 PM EST every day. The trivia that the game spits out isn’t the most cleverly written, and certainly the difficulty tracks from ridiculously simple to very difficult, but few of the questions are written unclearly and most are straight trivia questions that ask you to recall one simple fact without making any leaps in knowledge, like the anagram question I mentioned from HQ earlier. The gameplay structure, as mentioned, is a clever twist on what the other apps provide. As with other apps, if you get one question wrong, you’re out of the game. However, if you can make it past question 6 in their 12-question ladder, each question has a dollar amount, divvied up from the prize money on offer. For a $2,000 game, question 6 split $100 between each correct answer, while question 12 split up $1,000 per each winner. If you get a question wrong in this stretch of bankable answers, you still keep whatever you’ve won up to that point, but you’re out for the rest of the game. The game is far looser with its payouts: players often win something, and the payout threshold is lower at $10. Looking at my friends who have played this week, my The Chase teammate Heather has won $40, fellow BuzzerBlog writer Christian has won $5.16, and newsanchor/friend Dave Walls has banked $16.81 so far. My skepticism with this app is two-fold: one, I haven’t seen anyone get paid yet, although allegedly they pay out once a week once you request your payout; two, their silence on social media with regards to reaching out to their audience gives me pause. 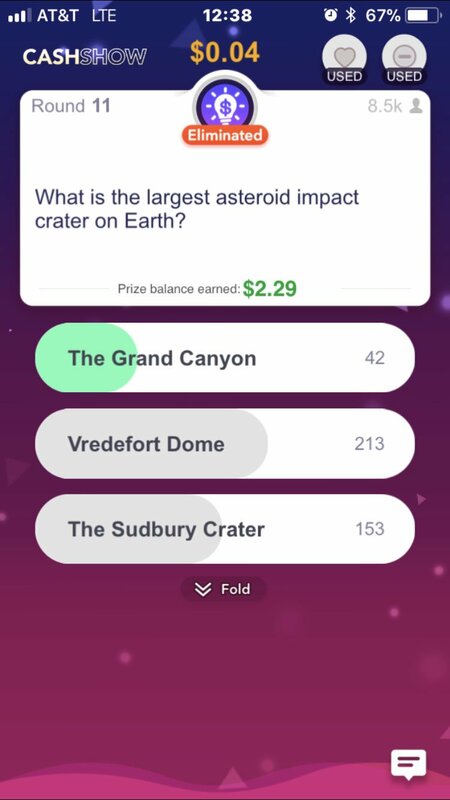 A few days ago, I was playing Cash Show and the game asked, “What is the largest asteroid impact crater on Earth?” with the choices being The Grand Canyon, Vredefort Dome or The Sudbury Crater. I used my “Wrong Used” lifeline that removes one wrong answer, and I was left with Vredefort Dome or The Grand Canyon. The Grand Canyon, a result of millions of years of erosion and not a meteor, was clearly the wrong answer. I, and 213 other people, chose the Vredefort Dome. While the voiceover verified we selected the correct answer, the Grand Canyon choice lit up and 42 people moved on to the final question. Attempts to reach out to the game via Twitter came up empty. Clearly, the error was a fat-finger input problem from the developer who inputted the question into the system, but the fact that nothing happened to rectify the situation to the people who complained on Twitter is disconcerting. I would love to give Cash Show my hearty recommendation. It’s easy fun, it gets straight to the trivia and it can be profitable if you’re relatively competent at trivia. Unfortunately, I haven’t seen anyone get paid out from the app yet. My payment of over $100 has been pending for the better part of a week. If I ever get that money and the other $60 that’s currently in my account, I’d be more than willing to give them my seal of approval. If HQ is the app equivalent of Who Wants to be a Millionaire, then Qriket is the app equivalent of Ant and Dec’s Red or Black. 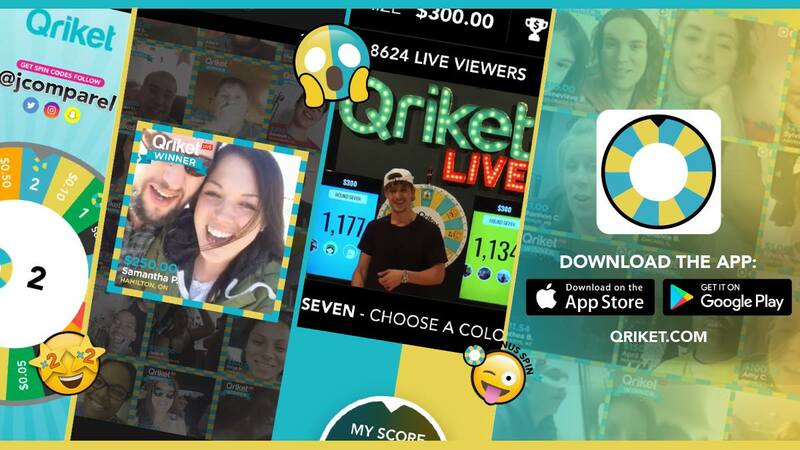 Hosted by “internet celebrity” Jonny Comparelli, Qriket started as an app that rewarded users for scanning QR codes and taking up deals from local businesses. The app had an in-game roulette wheel that would pay out dollar amounts between $0.05 and $500. It seems as if Comparelli and his team has shifted the app to be completely wheel-driven with their game show of blind luck. There are no trivia question in Qriket, a game that is built upon fostering and building a loyal community because there’s no challenge or thought to the game at all. There are ten rounds of play, and in each round, players must choose where the in-studio Qriket wheel will land on: blue or gold. The in-studio host will spin the wheel and if you call the color correctly, you get a pre-determined amount of points. Players with the most points at the end of the game split the 1st, 2nd and 3rd place prizes. Honestly, this game was boring to watch, more boring to play, and the game that I played ended up playing ended with the host spinning the wheel and landing on “ZERO” which meant every player ended the game with 0 points and no one won any money. They spun a virtual “everybody wins” wheel as a consolation prize so I spent a half-hour (the longest of any of the games I played) to win a nickel. I have a hard time recommending this game to anyone, because there is absolutely no skill involved at all. You might as well just let me open the app once a day to see if you randomly gave me money or not. Half of the fun of these game show apps is the fulfillment in answering trivia questions, and getting rewarded for the knowledge you have—the winning is loosely in your control. In Qriket, there’s nothing to do except pick Yellow or Blue and watch a YouTube-type personality over-act for half an hour. After monopolizing my life with game show for money apps, I’m starting to actively hate all of them. If I were to review them using BuzzerBlog’s review metrics, they’d all rate pretty low. The “game” is as simplistic as can be—it’s like going to a pub quiz except if you get one wrong, you’re asked to leave. The “show” is hit or miss—the host (if there is one) has no one to interact with except a chat he no doubt can’t read and his own self-satisfaction. And to call these “game shows” is at best technically accurate as everyone’s competing for money, but once I lose the game, there’s no incentive to continue to watch and there’s nothing left to play, so my engagement is immediately zeroed out. If I were to recommend any of these game show apps as something you should experience every day, I’d probably pick HQ at this point. It’s the most polished, the only one that has paid out a win, and has the biggest audience. If you’re in the UK, they have a UK-centric version as well, which shows growth and an understanding of their worldwide status. There is definitely room in this budding genre for something new and exciting. Any game that can combine interesting, well-written trivia with a game that rewards, in some way, watching the show all the way through, with a great game to watch will absolutely capture an amazing audience. I would say nothing like that has ever existed, but it has: Xbox Live’s 1 vs 100. Hint, developers: DO THIS. DO THIS ON MY PHONE AND YOU WIN. Update: It’s February 1, 2018 and there are a few updates to this article. First, after about a week, Cash Show paid out the money I had requested. At first, PayPal rejected the payment automatically but developer ZenJoy remedied the situation. They now get my official seal of approval. The Q reached out to me via Twitter to say they are “working on some meaningful differentiators” between them and HQ and they would keep me abreast of the situation.